The Hitachi EUB-525 F ultrasound machine is a full-featured, mid-size system that features B-Mode, M-Mode, Doppler, Color Flow, and Color Angiography. With its imaging technologies, combined with a 15” monitor and membrane style keyboard with multiple one-touch keys, the Hitachi EUB-525F streamlines workflows while aiming to increase accuracy for a wide range of imaging exams. 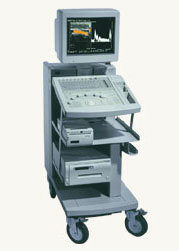 The Hitachi EUB-525 F ultrasound is highly rated for abdominal, cardiac, and OB/GYN applications.